Marine weather forecasts are getting popular slowly and steadily on the Arabian Sea coast of Thiruvananthapuram in south India, home to one of the largest and most diverse concentrations of artisanal (small scale) fishers. Amid this newfound interest in marine forecasts, research by the University of Sussex in Britain — in collaboration with Indian forecasters and Kerala State Disaster Management Authority (SDMA) — seeks ways to fill the gap between what forecasters offer and local fishers demand. In a policy brief released in February, researchers noted that there is often a gap between what marine weather forecasters provide and artisanal fishers accept as useful information to decide whether or not to go to fish, especially in rough weather. To fill this gap, the forecasters need to listen to the fishers, the interdisciplinary Sussex team said. Besides, forecast dissemination needs to be easily accessible in local languages to the last mile through different media. The forecast has to be precise, clear, timely and locally relevant and actionable. It requires teamwork — involving forecasters, media, local popular science groups and forecast users, the researchers pointed out. At one of the field study sites, in Anchuthengu village north of Kerala’s capital city of Thiruvananthapuram, the forecast for late February sea usually involves moderate breeze, and slight to moderate waves with occasional crests, or ‘white horses’ in sailors’ slang. “One-metre waves and 30 km per hour (kmph) wind is safe for us,” said Michael Joseph, a local fisherman with a 32 ft boat fitted with two outboard engines. “Still, fishers diligently listen to forecasts,” said his colleague Susa Melkias. Melkias leads the fishers’ disaster risk reduction committee of Anchuthengu that tried to make the local fishing harbour safer with a fishers’ own, makeshift signal system — a work still in progress amid red tape and a general disinterest among government harbour engineers about artisanal fishers’ safety issues. On the brighter side, Melkias’s efforts to popularise marine weather forecasts — an outcome of the Sussex research — found many takers in Anchuthengu as well as his native village Poonthura, another study site. 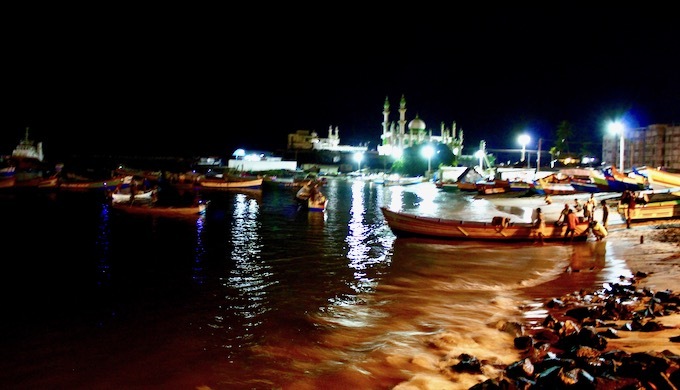 Poonthura fishers often sail south towards the shores of Kanyakumari, where seasonal easterlies turn around the cape, gusting to 60 kmph, generating enough waves to capsize a 32 ft boat. Over the past year, there has been an increase in marine forecast dissemination in Kerala. For the tech-savvy, there are regular forecasts available mostly online though their penetration to the last mile is often hindered with language and technology barriers. Forecasts tend to be in English. Though there are local language text services of ocean forecasts that are short and to the point, the fishers said they prefer voice. India Meteorological Department (IMD) has opened a new Cyclone Warning Centre (CWC) in Thiruvananthapuram in October 2018, in view of a trend of extreme weather events over the Arabian Sea. IMD’s regular coastal weather bulletins are picked up by local radio stations, but not regularly. IMD scientists said they were looking at better ways to interact with more users. Meanwhile SDMA, on its part, is considering services for fishers over All India Radio’s medium wave channels. There is also an effort to make wireless radio services more easily available. As Sekhar Lukose Kuriakose, member-secretary of SDMA, an outspoken scientist critical of forecasting traditions, said at the recent Kerala Science Congress: “Forecasters need to listen to those who listen to their forecasts as well.” At the Congress that focused on better disaster risk reduction measures, J. Sundaresan Pillai, head of climate change informatics at the National Institute of Science Communication and Information Resources, called for a network of boundary organisations that interface closely with different communities promoting climate and weather knowledge. The yearlong pilot field study by Sussex Sustainability Research Programme (SSRP), School of Global Studies, and Sussex Asia Centre tested ways to do precisely that — bridging barriers between science and society. Their work allowed forecasters to listen closely to the fishers, and produce forecasts they wanted in the style they preferred, together with them. The work has produced some early outcomes. INCOIS started talking about ocean currents, and fixed their forecast boundaries as the fishers preferred. SDMA limited the number of days when they restricted fishing on account of bad weather forecast by the IMD. On their part, IMD started giving more details on offshore systems, their track, timing and impact. IMD has acknowledged that better user interface design of forecasts helps in making them more relevant to user groups. It is a good start, as a top official noted. While Sussex researchers were designing their field study, Cyclone Ockhi devastated local fishing livelihoods. Midway through the study, a set of unusual oceanic and atmospheric phenomena led to a series of extreme rainfall events, leading to Kerala’s worst flood in a century, its impact amplified by denuded hills, clogged drainage basins, and discharge of water from many dams. Co-production has become a buzzword of late. As the UK Met Office notes, it promotes collaborative approaches in weather and climate services that meet standards of scientific credibility, while also being considered trustworthy, relevant, and legitimate among users. The new policy brief elaborates on how co-production can lead to more accurate accessible and actionable forecasts. The context is artisanal fishing becoming more predictable with modern technologies; still becoming riskier due to financial pressures that stretch the limits of fishing operations, even in rough weather.